While travelling to Kerala last year(dec), I had carried just one eyeshadow palette with me ~ Maybelline The NuDES Palette with me. And thats when I realised that its so much more than just an eyeshadow palette. So. 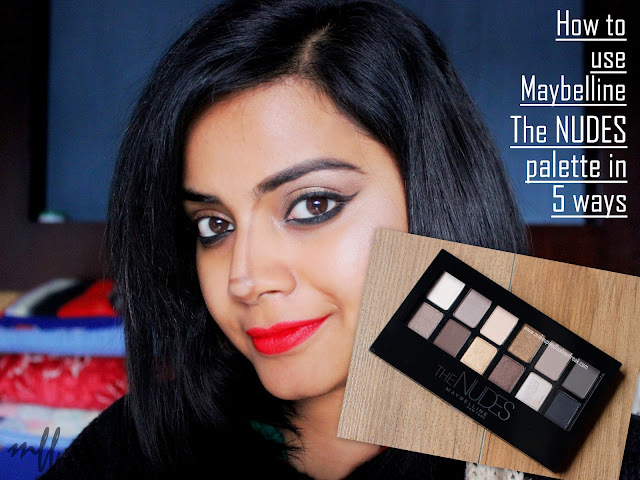 here's how you can use Maybelline The NUDES Palette in 5 ways. Keep reading to know.. I totally depend on this palette to fill my brows and I literally cant do without it. With an angled eyeliner brush, I mix the matte black and brown eyeshadows and fill my brows with it. Just dampen an eyeliner brush and go over the matte black eyeshadow and use it to line your upper lashline. To see how it looks, please see the first and last pic. Use the matte brown eyeshadow to contour your face. It does the job really well. Just that I won't use the brush shown in the pic. With a fluffy blending brush, use the above shown colors to highlight the high-points of your face.